EARRINGS - CATHE. GORGEOUS EARRINGS WITH A BAROQUE PEARL AS THE FOCAL POINT, SURROUNDED BY YELLOW RHINESTONES, WITH A SPRAY OF REDDISH OBLONG STONES. CLIP, SET IN GOLDTONE. THESE LOOK VERY VINTAGE, BUT CATHE IS A HIGH END DESIGNER FROM THE 80'S AND MAYBE INTO THE 90'S. 1 1/4" LONG, 3/4" ACROSS. STONES ARE CLEAR AND BRIGHT - ONE OF THE STONES UNDER THE PEARL ON ONE EARRING LOOKS DARK, BUT I THINK IS WAS THE ANGLE OF THE PHOTO - ALL ARE BRIGHT AND SPARKLY. 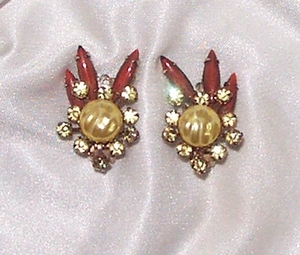 GOLDTONE IS FADED LIKE YOU WOULD EXPECT FROM EARRINGS FROM THE 50'S OR 60'S. VERY NICE PAIR OF EARRINGS OVERALL!